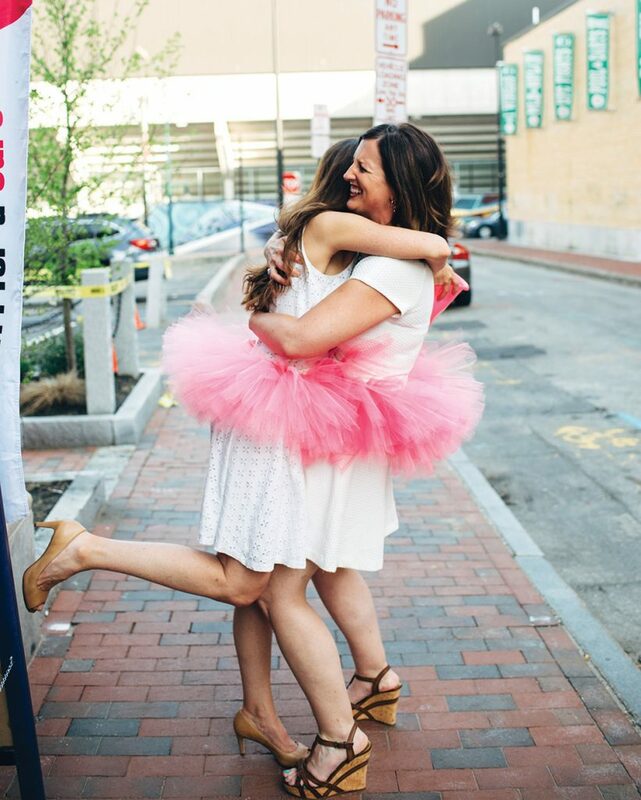 For Deborah Giroux and Dana Lesniak, it’s all about the power of the pink tutu. When they attend Tri for a Cure triathlon events in their signature outfits, the sparkly gauze skirts never fail to summon smiles and open wallets. The friends have channeled their formidable fundraising prowess into a cause that holds personal meaning for both. Sparkles aside, their passion for the Maine Cancer Foundation’s mission comes through in countless ways. That connection comes directly from personal experience. In 2009, when Lesniak, 41, from Portland, signed up for her first Tri for a Cure, her mother was in remission from lung cancer. But the cancer reoccurred and Lesniak found herself juggling fundraising, a full-time job and trips from Portland to New York to care for her mother. 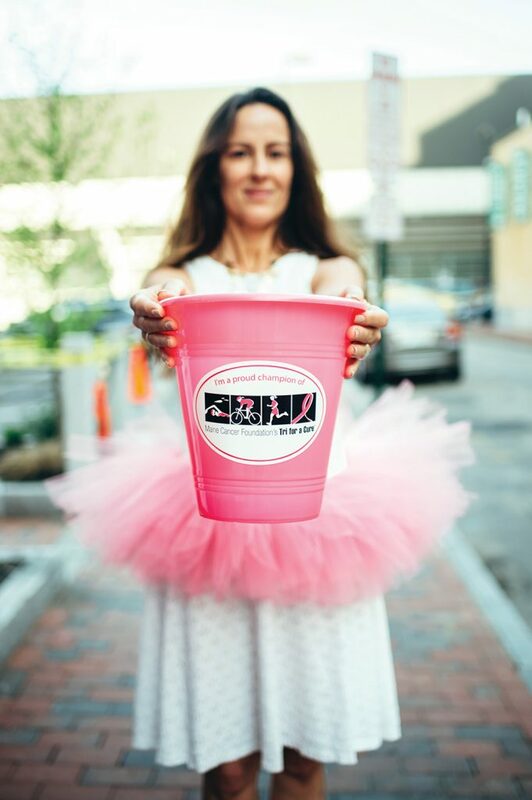 Deborah Giroux holds out a donation bucket during a Pink Tutu Ladies fundraising event at BRGR Bar in Portland this spring. 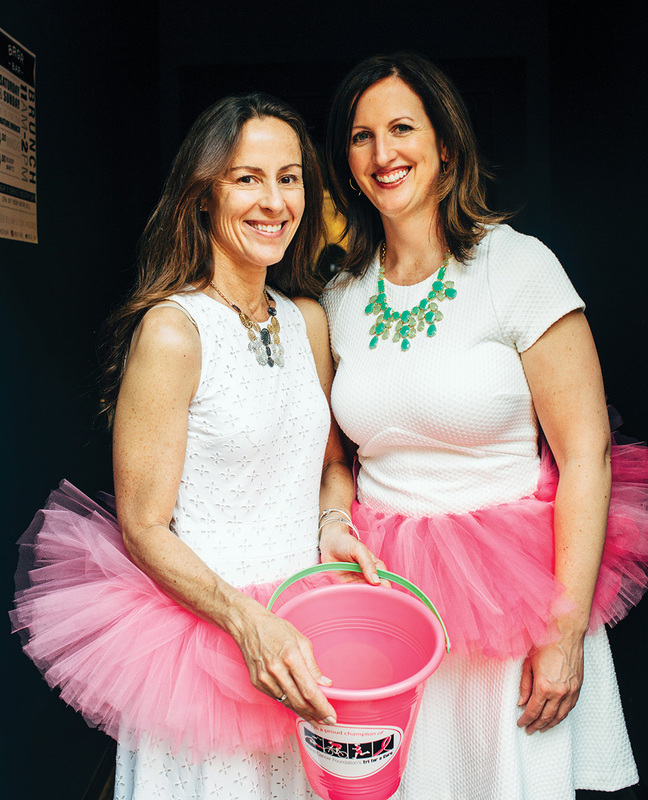 Giroux and Dana Lesniak, founders of Pink Tutu Ladies, are “fundraising geniuses” and champions for the work of the Maine Cancer Foundation. Lesniak finished the Tri and immediately drove to New York. Her mother died two days later. Since then, she’s channeled her grief into supporting MCF, from being a top Tri for a Cure fundraiser, serving on the development committee, and, most recently, joining the board of directors. Giroux, 52, has made prevention her mantra. “People can’t change the genes they inherit, but they can eat well, exercise, get recommended screenings and choose a trusted doctor,” she says. A long-time runner, Giroux signed up for the Tri for a Cure five years ago to challenge herself as an athlete. Like Lesniak, she was moved by the event’s spirit of camaraderie, and she soon became involved in many aspects of MCF’s mission. But when her father was diagnosed with throat cancer in 2015, the impact hit home in a visceral way. Thanks to her work with MCF, Giroux had the knowledge to help her parents navigate treatment options, doctor appointments and medical bills. In 2014, Lesniak and Giroux were co-workers at UNUM and training for the Tri. Out of group brainstorming sessions, the Pink Tutu Ladies were born. Today, a dedicated band of about a dozen women put on tutus and big smiles, taking to the streets before concerts or Portland Sea Dogs games to collect donations. In three years, they’ve raised over $100,000 for the Maine Cancer Foundation, including $60,000 in 2016 alone. And those numbers don’t include the funds the Pink Tutu Ladies are raising for the 2017 Tri. On the day of the Tri, the course is dotted with colorful tutu-clad racers and supporters. Giroux and Lesniak have consistently been top fundraisers for Tri for a Cure. Typical of the spirit of cooperation surrounding the Tri, in 2015 Lesniak set a goal to be the No. 1 fundraiser, but she hit some rough spots in her life. Giroux—also training and fundraising for the Tri—was right there mobilizing her friend. When Lesniak reached her goal, she turned around and gave the prize-winning mountain bike to Giroux. That’s how these women roll. In the fight against cancer, the Pink Tutu Ladies are leading the charge, one smile at a time. Lori Douglas Clark is a journalist, poet and community volunteer who lives with her family in Readfield.